One day while Mitch Payton and MXA’s Jody Weisel were reminiscing about the old days, Mitch said, “If you want to test our 2019 Supercross bike, just tell me the day.” You would have thought Jody would have said, “Great! How about tomorrow? Or later this afternoon?” but he didn’t. “Let me get back to you, because we are booked solid with test bikes for at least three weeks. We want to do it, but it will have to wait,” said Jody, and they went back to telling stories about Jeff Jennings and Andy Jefferson at the Golden State Series back in the 1980s. Three weeks later, Jody called Mitch and said, “We want to do it Wednesday.” Mitch replied that Austin Forkner’s 2019 AMA 250 East race bike would be sent out with mechanic Ollie Stone and that Bones Bacon would come along to handle any suspension issues. Austin Forkner’s Pro Circuit KX250 is a melding of factory parts, Pro Circuit components and some secret sauce that we aren’t allowed to discuss. 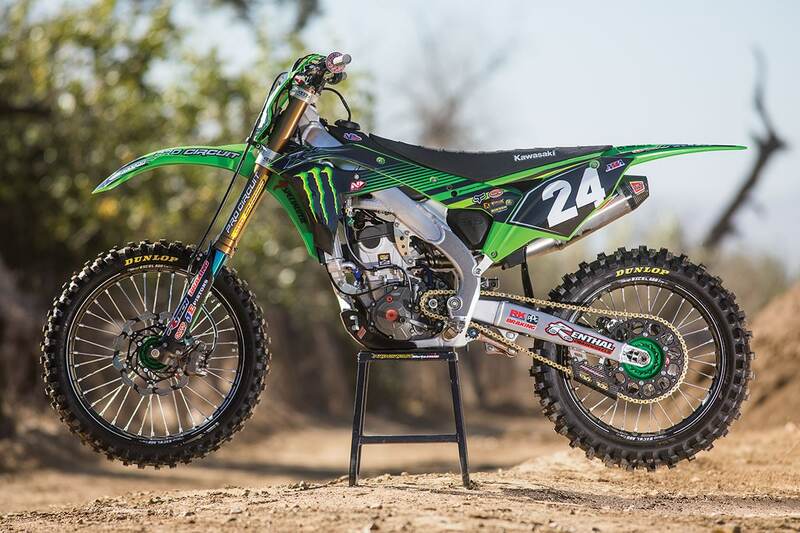 But, in truth, many of the parts can be bought from the Pro Circuit catalog—so you could build your own Austin Forkner Replica—to a point. Mitch Payton uses what he feels are the best products. Of course, if Mitch doesn’t like what’s available, he builds it himself. 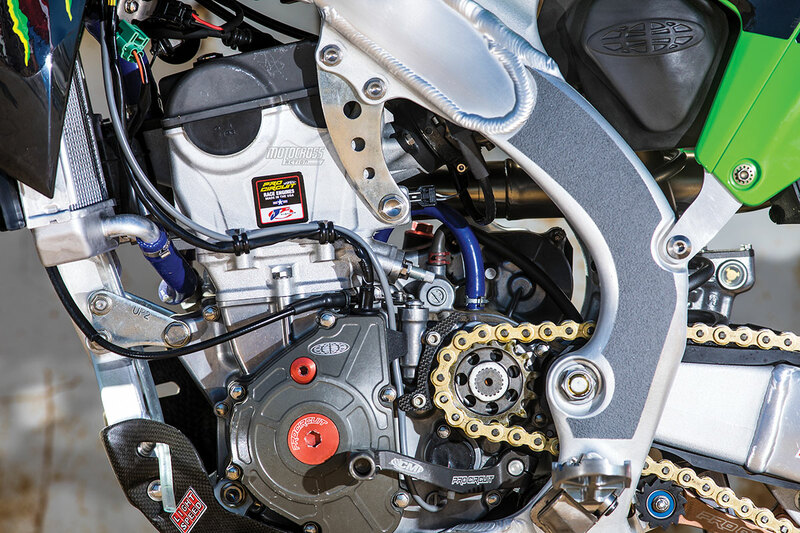 No expense is spared—which is why Pro Circuit has won over 200 AMA Pro races and more titles than any other team. The MXA wrecking crew decided to break Forkner’s 2019 Kawasaki KX250 race bike down part by part. It is an extensive list of mods, but it gives you a good idea of how far a modern race team has to go to stay competitive. Let’s start at the front and work our way back. Wheels: The most intriguing thing about the wheels on Forkner’s KX250 isn’t that he runs KHI factory Kawasaki hubs or A60 rims and titanium axles, but that the rear tire is a Dunlop MX33 in a 120 width. That is a big rear tire for a 250cc four-stroke to turn, but the Pro Circuit engine is more than capable of spinning it up. Not just longer link arms, but a completely new rising rate. 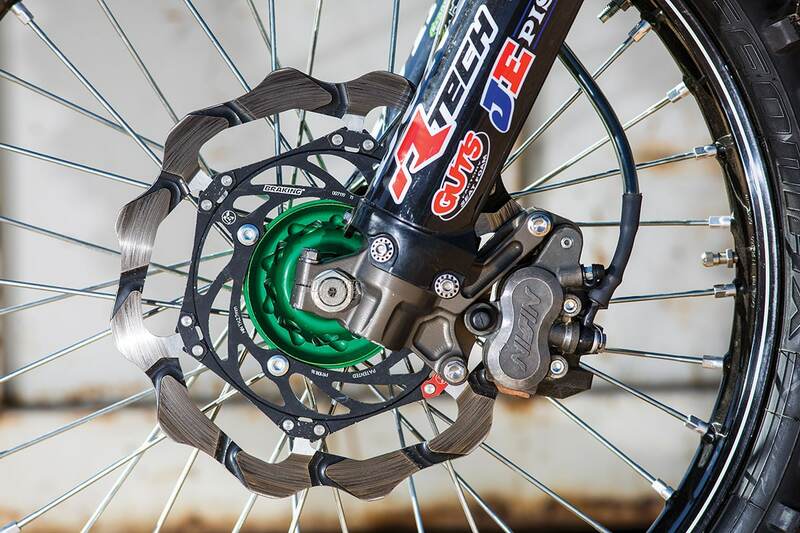 Brakes: Pro Circuit relies on a 270mm Braking dual-rivet front rotor. The calipers are magnesium Nissin works parts—and even the brake pads come from the KHI works parts bin. A closer look at the rear caliper reveals that it has been machined out to allow air flow to run through and around the pads. Even freakier was that the rear brake piston had been drilled just below the lip all the way around for even more cooling. 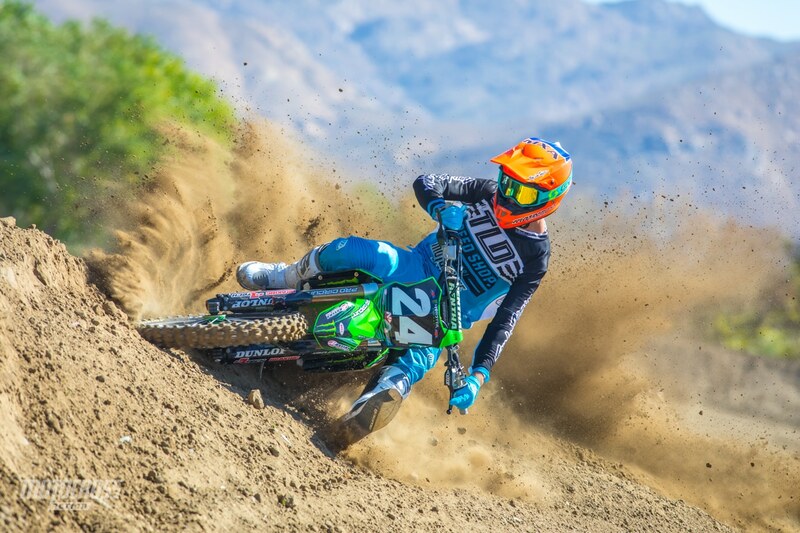 Austin Forkner prefers ARC levers, but not the aluminum ones; instead, Austin uses the Memlon composite levers. The perch is machined out so that a nylon bushing can fit between the lever and the bars. This allows the perch to move in a crash to keep the perch and lever intact. Handlebars: There’s nothing too out of the ordinary in the control department. 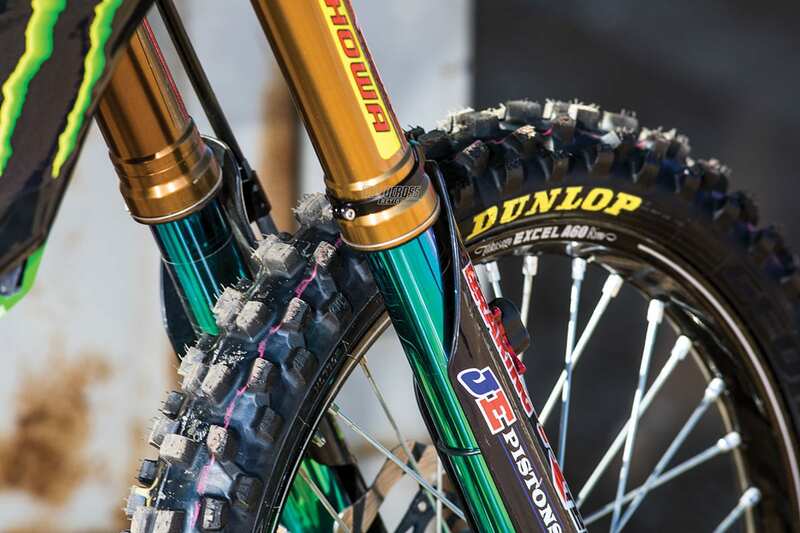 Forkner runs Renthal 996 TwinWalls (okay, we confess that these are special lightweight TwinWall bars). The grips are Renthal soft half-waffle models. The bars are mounted to standard-height bar mounts on 24mm offset Pro Circuit triple clamps. 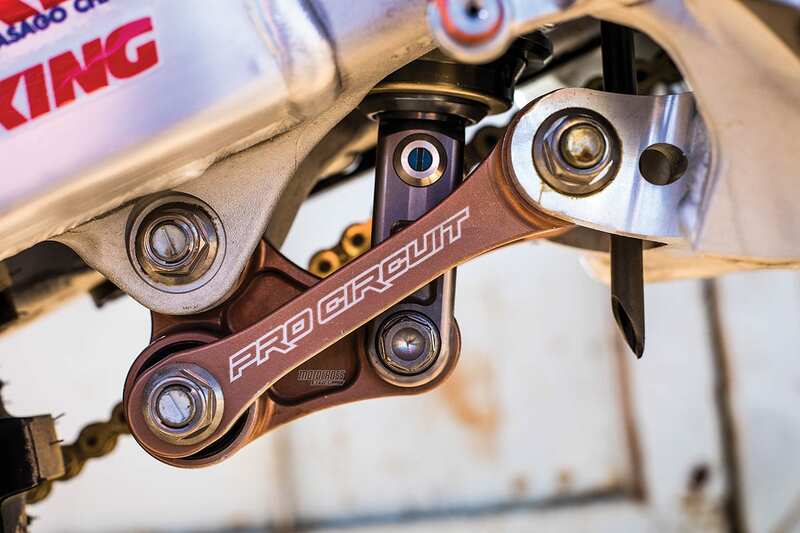 In conjunction with the handlebars are 5mm-higher, CNC-machined, titanium Pro Circuit footpegs with custom-made mud covers to ensure that they fold back down in a pinch. The brake pedal is a KHI works version with a different folding tip and a CNC-machined clevis at the rear. Don’t let the multiple adjustments on the works forks confuse you. You’d have to be really fast to ever get near these Showa units. Plastic/carbon/bolts: Pro Circuit designed its own carbon fiber skid plate and had LightSpeed build it for them (it is available for sale through LightSpeed). The rear chain guide is also carbon fiber and for sale. The carbon fiber rear caliper guard is not for sale. All of the plastic is from R-Tech and is secured with aluminum bolts wherever strength is not in question. INSIDE THE ENGINE IS WHERE THE BIG SECRETS LIE—AND WE DON’T BLAME PRO CIRCUIT FOR NOT DIVULGING THEM (WHAT WE DO KNOW ABOUT THE ULTRA-TECH STUFF, WE VOWED NOT TO TELL). Every other bolt on the bike is titanium, including the engine bolts, pipe bolts, triple-clamp bolts and axles. The Ti parts extend to the radiator overflow catch tank, which is a work of art. The seat bolts are not stock but instead have been turned down so that they can be removed with an 8mm T-handle. Pro Circuit makes its own axle blocks for the rear wheel. The head stays are drilled out to allow the frame to be more resilient. 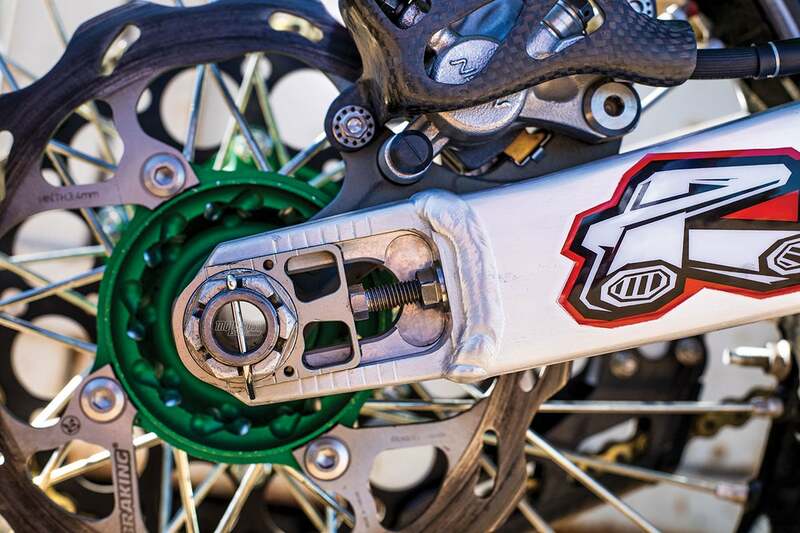 Forkner likes this mod, but not every Pro Circuit rider uses the drilled-out head stays. This is one trick front brake—from the 270mm Braking dual- rivet rotor to the magnesium Nissin caliper, this is pucker material. Airbox: Twin air provides the air filters for the Pro Circuit team. For the AMA Nationals, they cut open the blocked-off right side vent in the side of the airbox but leave it closed during the Supercross series for sound testing. Seat: We were surprised to learn that Pro Circuit keeps the stock seat base but changes the seat foam to a lightweight foam that saves 1 pound. The seat cover is from N-Style, as are the team graphics. 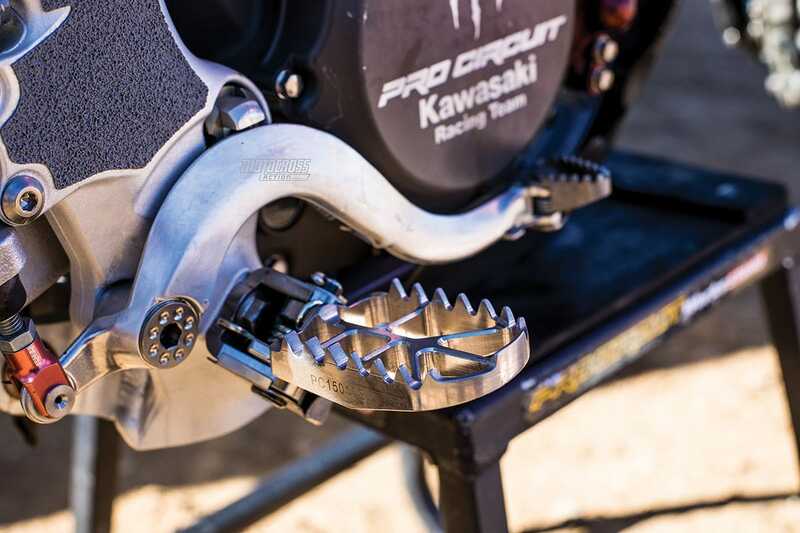 Miscellaneous: Pro Circuit has its own holeshot device, which features a high and low setting, with most riders opting for the lowest option. 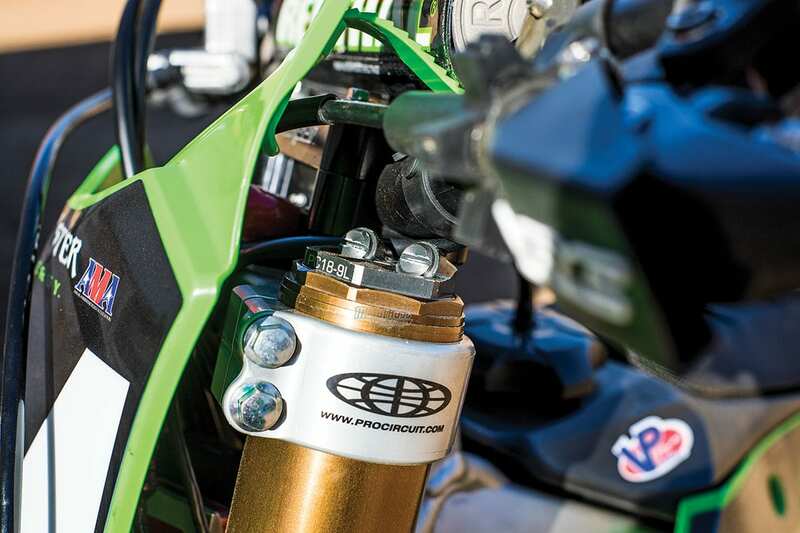 Pro Circuit’s engine hose kit is more hydrodynamic than the stock KX250 water hoses. Pro Circuit also builds its own water pumps and impellers to improve cooling efficiency. The radiator cap is also upgraded from the stock 1.1 kg/mm2 to a 1.8 to raise the boiling point. What you don’t see connected to the parts and components listed above is the care that goes into building each and every race bike. All the components are stripped, cleaned and repainted. If gusseting is required, it is done with fish-scale precision. Each and every Pro Circuit mechanic strives for perfection. But, as you may have noticed, we haven’t touched on the engine or suspension. The engine is where the hard work and long hours come into play. Pro Circuit has two dynos working to make sure that the pieces inside the engine release every iota of power possible. Of course, inside the engine is where the big secrets lie—and we don’t blame Pro Circuit for not divulging them (what we do know about the ultra-tech stuff, we vowed not to tell). 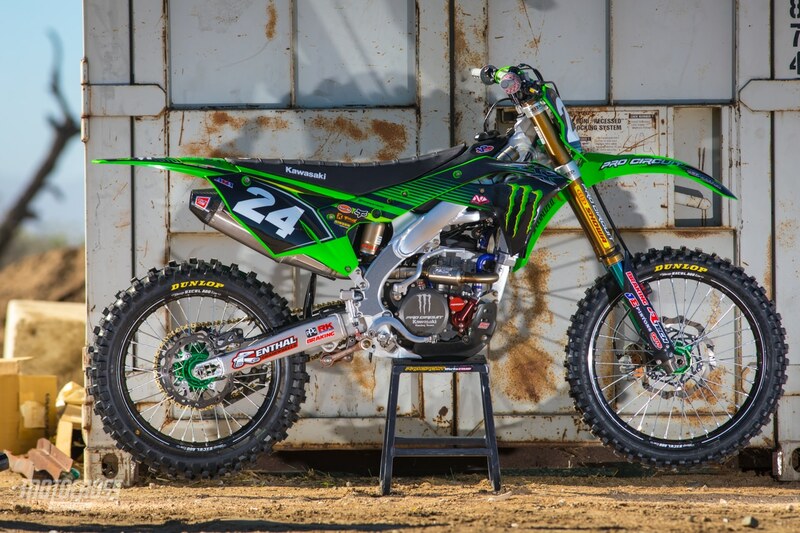 Pro Circuit will sell you all the major parts inside Austin Forkner’s KX250 engine. However, the gearbox and ignition are off limits. Pro Circuit’s main business since its Husqvarna days in the late 1970s has been exhaust pipes. And when it comes to Kawasaki KX250F pipes, Pro Circuit has more experience than anyone on the planet—and that includes Kawasaki itself. 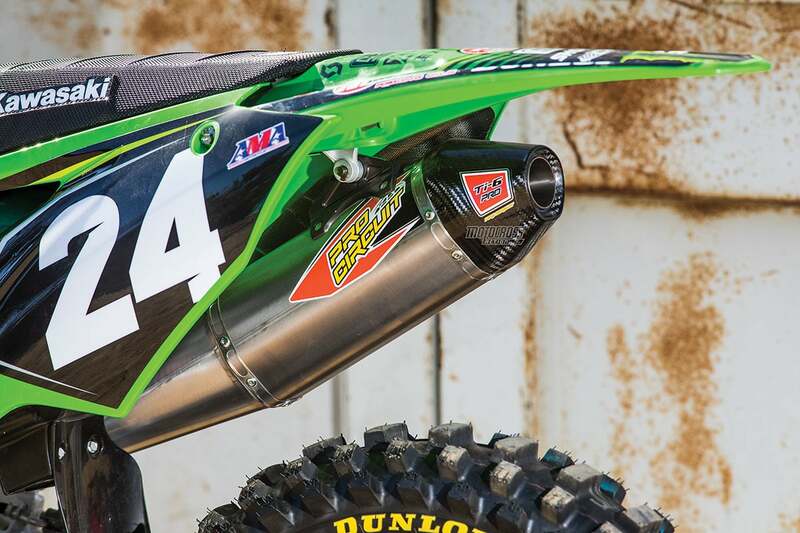 Forkner’s exhaust pipe is an off-the-shelf titanium T6 Pro model that has an extra layer of titanium wrapped around the head pipe to lessen rock dings. It is possible that some Pro Circuit riders might have slightly different head pipe lengths or dimensions to suit their personal styles, but the base unit always starts as the pipe that Pro Circuit sells to the public. 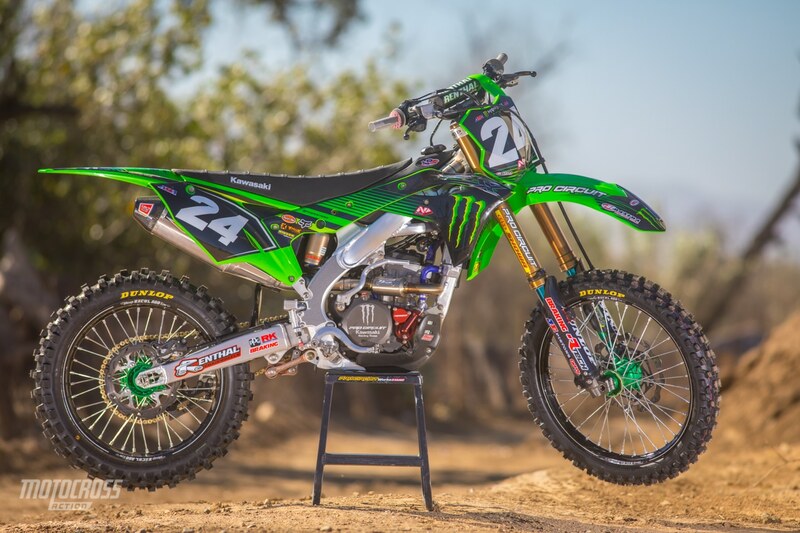 Forkner’s engine uses proprietary Pro Circuit pistons, valves, keepers, springs, camshafts and wrist pins. There are special parts made for the connecting rod, and the crank can have its weight and balance changed (we know this because when we built a full-race KX250F two years ago, Mitch lightened our crank for quicker acceleration—but it is not a service that he offers to the public). Everything is drilled, anodized or safety-wired. On a four-stroke, the head is work central for power management. Mitch ports each cylinder by hand, adds beryllium valve seats and coaxes more power by improving air flow through the intake and exhaust ports. The Pro Circuit team does not use the stock KX250 gearbox. They have special gearboxes made in England, using high-strength metals and gear ratios that differ from the stock ratios in that they are based on the amount of rpm drop per shift—not on whether second gear is closer to third. Although we could tell immediately on the track that first gear was taller, which probably translates into the most used gears being a little closer to each other throughout the ratios. The stock sprockets are 14/52. In Supercross, contrary to popular belief, the riders try to run higher gears, especially in the whoops, to lessen gear lash. Of course the British gears are polished and coated for superior performance. At one time, Pro Circuit made extra gearboxes and offered them to the public, but the price was not conducive to sales, so they dropped the idea. This hand-made titanium catch tank recycles radiator fluid back into the radiator after it cools down. Pro Circuit used to run GET ignitions, but now they use KHI works black boxes that are completely tunable. They also have the requisite GPS sender for data acquisition and comparison. We were not surprised to learn that their race bikes run on AMA-legal fuel but that VP blends Pro Circuit a special brew. The engine oil is from Maxima. To help get the fuel into the engine, Pro Circuit designs and molds its own special shorter intake tracts from the airbox to the throttle body. THIS PAST YEAR TO GET MARRIED AND TO GO FISHING—BUT NOT NECESSARILY IN THAT ORDER. Pro Circuit suspension guru Bones Bacon retired earlier this past year to get married and to go fishing—but not necessarily in that order. Mitch hired Showa technician Adam Walters to take Bones’ place in the shop but signed Bones to a consulting gig with the Pro Circuit/Monster Energy race team. So, when Austin Forkner’s KX250 showed up on test day, Bones showed up with it. Forkner’s KX250 is outfitted with 49mm Showa works forks that are Kashima-coated and have a turquoise tint and wider axle lugs for more steering accuracy. Inside are 27mm cartridge tubes, replacing the old-school 25mm units. As works forks go, they are fairly standard issue. And while you can’t actually duplicate them, the latest version of Showa A-kit forks can be ordered for $9500. Pro Circuit uses the coil-spring version but with air assist. A close look at the fork cap reveals three adjuster screws. The first adjusts the compression damping. The second can be used to add or subtract air to change the feel of the fork spring. The third is for a sensor to feed back electronic data about what is happening to the fork. Since we had elected to mount Forkner’s outdoor fork on the bike, it was actually ridable by normal humans. In fact, when the MXA test riders complained about certain sections of the track, Bones made a few quick adjustment to bring the forks into compliance. Nice stuff, but we can’t imagine what the price tag might be. The Showa shock features a 50mm shock body and an 18mm shock shaft. Pro Circuit had added a bladder cap and a special HSS coil spring. Bones told us that while the HSS steel coil-spring shock is not available to the public yet, it will be soon. It offers the springy feel of a titanium spring without the worries of the spring rate being off. Additionally, although made from steel, its weight is closer to that of a titanium spring than to a typical steel spring. Works forks always glisten thanks to titanium-nitrate coatings. We loved the feel of the shock and the HSS spring, but we were most intrigued by the Free Lock preload adjuster. It consists of two preload rings—one with spring-loaded ball bearings inserted into pockets in the ring. You pry on the bottom preload ring to change the ride height and, when you find the proper setting, the spring-loaded ball bearings lock into place in the detents on the second ring. It also is not for sale. Below the Showa works shock is a complete Pro Circuit linkage system. Not just longer link arms, a full system with a new rising-rate bell crank and different-length arms. The ratio has been changed to be stiffer initially to hold the shock higher in its stroke and can then be tuned via the link arm length to determine the starting point on the rising-rate curve. Nothing Mitch builds would be complete without his magic exhaust system. All that was left for us to do was to ride Forkner’s bike. It would have been immensely helpful if KTM, Geico and Star Yamaha had lent us their bikes to compare against the Pro Circuit Kawasaki KX250, but that wasn’t going to happen in this lifetime. It should go without saying that this bike is not what they sell in the Kawasaki showrooms across America. It is a purpose-built race machine, designed, configured and built for a very small handful of talented young men who are capable of getting the most out of it. It had amazing acceleration that carried through the midrange. It didn’t require a lot of clutch work to keep it moving. It wanted to run free, so we let it. It was a little challenging to push the limit on a bike that wants to rev so much. 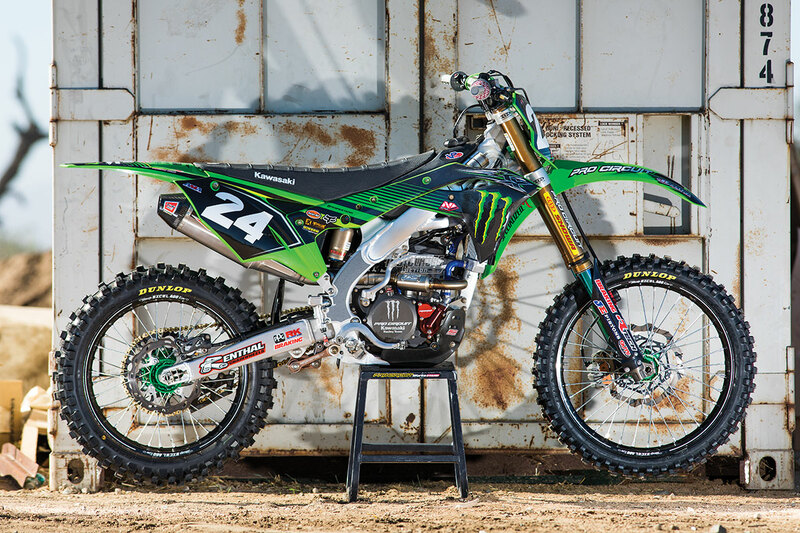 Our pro-level test riders adored Forkner’s engine. By attacking corners and powering into whoop sections, we realized the potential of a works bike versus a production bike. 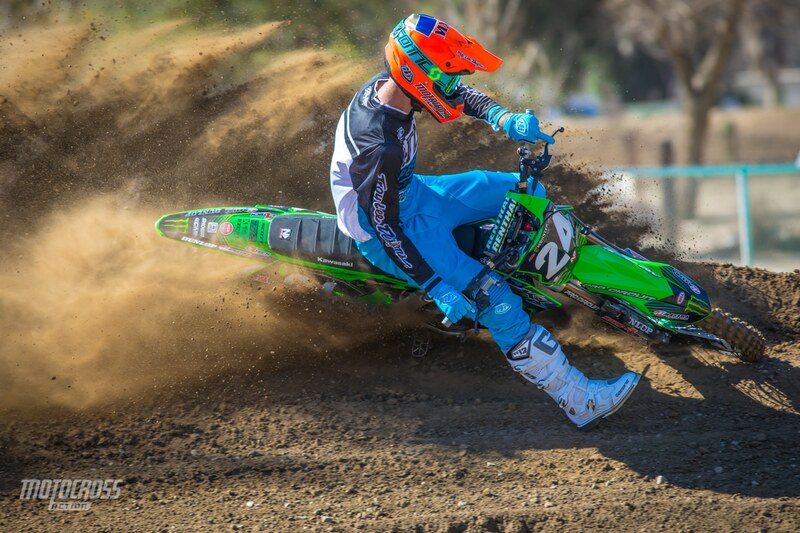 As far as the suspension, every MXA test rider felt right at home on Forkner’s setup. The forks settled into corners, and the coil springs urged the front wheel to follow the ground perfectly. There was speed to be found in the ability of Forkner’s forks and shock to ignore anything in their way. 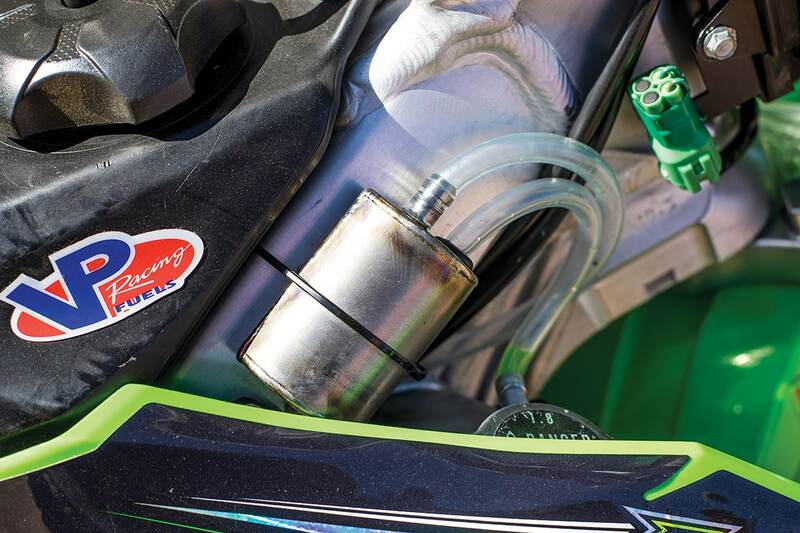 We wish everyone could feel the thrust of the Pro Circuit KX250. But unless you have Mitch’s number on speed dial, that isn’t going to happen.